Rightstuf is on a streak of licensing critically-acclaimed, but undervalued, shows. They released Utena in 2011 and announced the future release of Rose of Versailles. My favorite recent Rightstuf release remains Nadesico. Unlike Utena, Nadesico has always been available used at an affordable price even after the ADV release went out of print, so I was surprised that Rightstuf chose to re-release it. I think it speaks to how relevant it remains, particularly with the resurgence of another giant robot show, Evangelion. Still, even standing alone, Nadesico remains an entertaining show because of its blend of comedy, science fiction and drama. 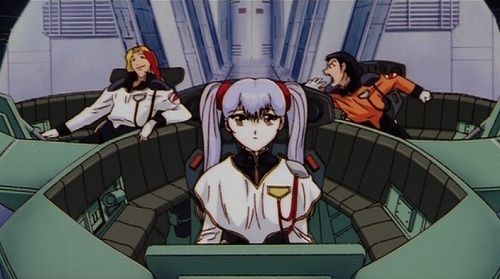 Nadesico has a typical sci-fi plot: aliens invade earth and a group of misfits are assembled to crew a space battleship, also called the Nadesico, and fight the aliens off. The main character is a boy named Akito, who survived the aliens attack on his home on Earth’s Mars colony. 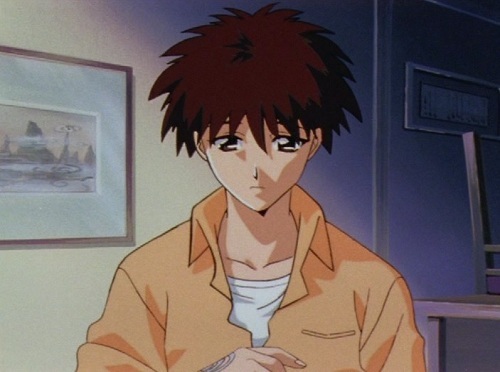 Akito joins the Nadesico as a cook, but finds his calling as a pilot of a mobile suit. 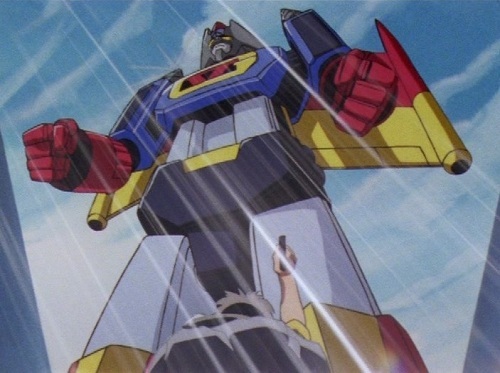 This is all fairly typical 90s giant robot fare. If Nadesicco was a pure sci-fi action play it would be alright, but not distinctive. Luckily, Nadesico is more than just an action show, it is also a satiric comedy. Much of that comedy revolves around an anime show that exists within the Nadesico universe called Gekiganger III. Gekiganger is a parody of giant robot shows of the 70s. 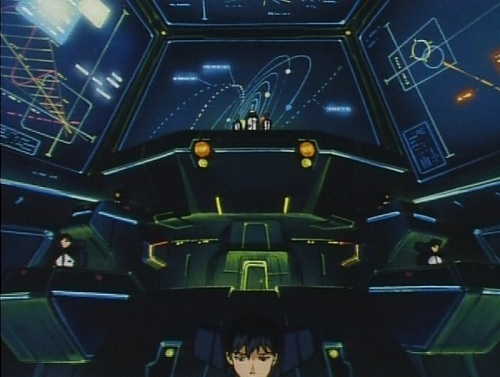 Akito learns about it shortly after boarding the Nadesico. He quickly becomes obsessed with it and the rest of the crew soon follows. Initially the Gekiganger references make light of otaku culture and the anime industry, such as the prevalence of anime merchandising. Later on, it’s also a vehicle to tweak major tenants of the giant robot genre, such as the ridiculousness of signature attacks and morphing giant robots. The pot shots at otaku and the industry are fun, but the Gekiganger plot device doesn’t get truly interesting until Nadesico uses it to expose the characters. After invoking Gekiganger to give themselves courage, the crew must decide if they are as pure as the cartoon characters they try to emulate. For example, when Akito finds out who his enemy really is, he must confront the fact that he may not be fighting a battle of pure good versus pure evil. At the same time, he feels compelled to keep fighting, to protect his friends and to avenge those killed in the war. This prompts some self reflection on his part. These types of moral conflicts provide depth to the characters, even though at times they come off as heavy handed. If the show has a weakness it lies in the female characters’ obsession with Akito. As with many 90s era shows, the entire female crew of the Nadesico is somehow infatuated with him. Now, Akito is nowhere near as bad as truly pathetic 90s leads, who also had female co-stars enthralled, like Shinji from Evangelion. Akito is initially whiny like Shinji but he quickly grows out of it. Still, the romance between Akito and the female crew members never seemed realistic and quickly became boring. They never really added anything to the show. 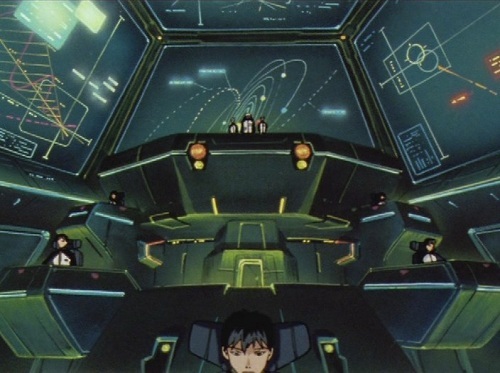 Of course, I’d guess many readers of this blog already own Nadesico. I bought the release when ADV was still in business, and when Rightstuf announced the Nadesico license I wasn’t sure about buying it again. Ultimately, I liked the show enough to do so. In terms of physical packaging, it’s a top notch release. I particularly liked how the art on the individual DVD cases matched the contents of the episodes on the discs. For those that own the ADV release and are unsure of buying this re-release, I’ll say that the video quality is better, but only marginally so. The set does include a remastered Japanese print. The print has more accurate coloring compared to the original release and looks cleaner, but it doesn’t redefine the show. Consequently, it doesn’t justify a re-purchase by itself. The set does come with extras, including the Nadesico movie and a previously web-only OVA of Genikganger episodes. I found the OVA episodes grating and became bored about 20 minutes in, but they might appeal to big fans of the series. The movie is good, but it has a far more serious tone compared to the show. It’s still available for around $6 on Amazon, so it’s not necessary to get the new set just for the movie. I won’t review the movie here, it deserves its own post, but I’ve provided photos below for a comparison of the picture quality between the Rightstuf and ADV versions. On the whole, Nadesico is worth the $45 Rightstuf is charging. But if you already own the ADV version you don’t need this re-release unless you are a die hard fan. Save your money instead and pray for a Blu-ray release. Or if the money is really burning a hole in your pocket, take advantage of some Cyber Monday anime sales. Just don’t expect to find 90s fare that’s much better than Nadesico. It’s still a big sore point when RightStuf refuses to license Blu-rays, and then they pick up titles that either look much better on Blu-ray or got a remaster for Blu-ray… Or at least, that’s what a die-hard fan would say while still buying these things. I try to placate that sore by pretending that Rightstuf will see my purchase and use it as a reason to license the blu-ray in the future. There is some hope, at least In his interview with ANN the CEO said that the percentage of people buying on blu-ray has increased. At the same time he also said that like high authoring and replication prices still make it unprofitable. Maybe if they do an Utena blu-ray release and it does well they’ll do other shows, but even an Utena blu-ray is uncertain at this point. The most clever part of the whole good-vs.-evil aspect in the show is that the Jovians have based their whole society around Gekiganger 3, which means that they _should_ be therefore morally pure good guys, but instead it turns out that it makes them much more evil than the “good” Earth characters. Alternatively, perhaps the Gekiganger characters are not as perfect as they seem on the surface and the Jovians reflect that. Of course, the Jovians seem numerous and different enough that it is difficult to generalize about them.